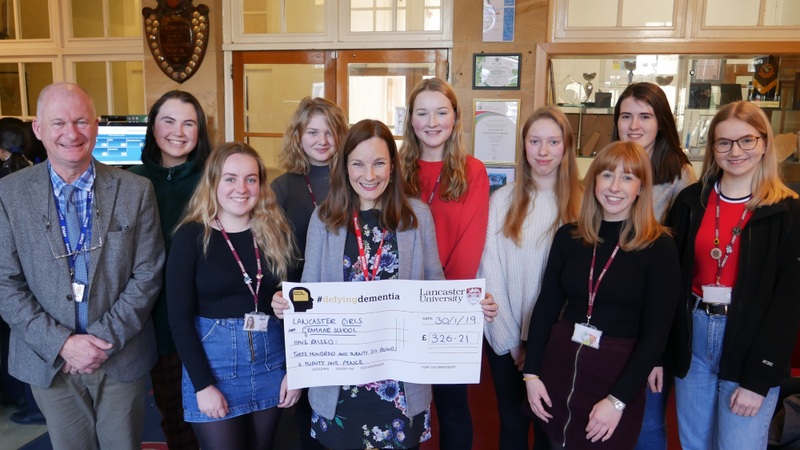 Our Perpignan House Team, headed by House Captain Jess Fairclough and the House Charity Team, consisting of Heather Hartley and Maddie Green, have all been extremely busy this academic year. The girls have organised cake stalls, House assemblies and have been busy collecting money within their House for their chosen charity 'Defying Dementia'. Pictured above are some of the team presenting a cheque for £326.21 to a representative from 'Defying Dementia'. Defying Dementia are a community supported campaign which aims to raise awareness and funding in support of the neuro-degenerative disease research which takes place at Lancaster University. The aims of the research are to develop new drug treatments, early diagnosis and the testing of existing drugs in the treatment of diseases including Alzheimer's, Parkinson's and Motor Neurone Disease. There are currently seventeen researchers, including PhD students, who work in laboratories at Lancaster University and these researchers work alongside other institutions in their goal of discovering new treatments and possible cures for dementia. Everyone will know someone who has been affected by Dementia and if you wish to make a contribution please click on the link below. I am very proud of the work our students do, they always set an example to others and should be very proud of themselves and the work which they do on behalf of Perpignan House and our school. Mr Robin Williams, Staff member responsible for Perpignan House.